Soon Seaworthy’s vessel, the Brunhilde, is under weigh (or perhaps underway.) Finnegan and his companions sail around the world, following the coast from Texas south along Latin America then across the Atlantic to Africa and north to Europe. The ship stops at every port, and in each port the Devil does his work – Finnegan, reading the newspapers, realizes that each town they visit is stricken, a few days later, by mass murder, riots, or similar large scale mayhem. The crew and passengers of the Brunhilde split into hostile factions and become embroiled in a sneaky back-stabbing fight against each other which culminates in a tremendous firefight in Greece with WWII rifles and machine guns. Anastasia and the Devil are among the dead, while Seaworthy, apparently the leader of the victorious faction, and Finnegan, who sat the fight out, survive. In the second half of the book Finnegan seeks revenge on Seaworthy, whom he blames for the death of Anastasia, but when Seaworthy survives Finnegan’s attack, Finnegan flees across the United States, a squad of murderers on his tail. The page count of this part of the book largely consists of strange and amusing stories not directly connected to the Brunhilde/Finnegan/Seaworthy plot at all, stories about and told by the various characters Finnegan meets while on the run. She was vital and pretty, she had been prettier than Anastasia Granddaughter, though fairly destitute. She would have been able to feed a small family of visiting mice, but that was all. She wouldn’t have been able to feed a large family of visiting mice. The moon lacked a week of being full, but the night was very bright. Here on top was nothing but rocks and gnarled old branches and stump trees. That is the way the top of the world always looks. But by Greek moon it was even stranger. Moonlight is different in Greece. As you know, it was the Greeks who invented the moon. I read the 1971 Avon paperback (V2406) with the black Bosch-style cover. The history of the book seems almost as crazy as the story it tells. According to Wikipedia two portions of the book are missing from this edition, including the final chapter, which the publisher didn’t receive in time. I get the idea this is a relatively rare paperback; I paid almost ten times the cover price for it at Half Price Books; luckily the cover price is 75 cents. I enjoyed The Devil is Dead and recommend it. 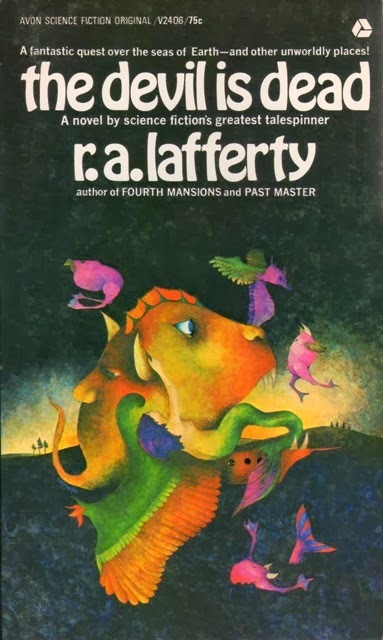 It is unconventional, but once I fell into step with Lafferty’s style it felt comfortable, I laughed at many of the jokes, and even the Promantia was explicable when I reread it after finishing the novel. Readers interested in literary SF, Roman Catholic SF, or books you have to “figure out” should definitely give it a whirl. I really should pick up Fourth Mansions.... It wants to be read! Lafferty is a name that I hear bandied about various, more informed discussion on sci-fi, but an author who I know nothing about. Have you read any of his other books? What I'm driving at is, is The Devil Is Dead a representative work, i.e. are all of his works so... bizarre? No shame in being bizarre, just curious whether this might be a good starting place. I've read a few of Lafferty's short stories and written about some of them on this blog, but The Devil is Dead is the first Lafferty novel I have read. I have two other Lafferty novels, Reefs of Earth and Past Master which I may read soon. Then I'll have a better sense of Lafferty's larger body of SF work. And maybe soon we'll be hearing from Joachim about Fourth Mansions! Thank you for posting this review! The Devil is Dead is among my favorite novels, and Lafferty is by far my favorite author. It took me 2 1/2 readings to unravel the plot. As he says in the Promantia, this is a do it yourself nightmare. You have to understand how the parts work before you can assemble them in an order that makes some form of sense. - Fourth Mansions an everyman's journey through a time of turmoil in our nation as various external forces (in the form of secret societies with perhaps a few supernatural powers) try to take control of Humanity's destiny and try to prevent us from evolving into the next step of spiritual and social consciousness. This was based on the writings of Santa Teresa de Avila and her book Interior Castle. - Okla Hannali possibly Lafferty's single greatest book, and the only one still in print (though Centipede Press is releasing a collection of his short stories later this month). It is the tale of the Choctaw Indians over the course of the 19th century. It is the story of the Trail of Tears and the forced relocation of most Native American nations to India Territory (modern day Oklahoma). It is also the story of Hannali Innominee, a fictional buffalo bull of a man, who embodies the stories and characteristics of dozens of real Choctaws and who represents an indomitable force for life, laughter, love, and survival. If you can read this book without both chuckling and crying, you are made of much sterner stuff than I. It is simultaneously funny, sad, and beautiful. - Any collection of his short stories you can find, especially Nine Hundred Grandmothers. I have Reefs of Earth and Past Master and will read them relatively soon. Like Kevin, I'm a huge Lafferty fan. (In fact, I found your blog through a post on a Lafferty fan group on FaceBook.) AFAIK, I have all of his published work including that published by several small presses that sprung up specifically to bring unpublished Lafferty into print. I met him once at a Worldcon and got him to sign an HC copy of Past Master (even though I already had the original Ace 1st edition) that I bought specifically for the purpose. I've read most of it. My favorite novels are Past Master, Fourth Mansions, Arrive at Easterwine and, of course, the magnificent (but not SF/F) Okla Hannali. I finally got The Fall of Rome via an Amazon auction, but I haven't read it yet. The Devil is Dead is the middle part of a trilogy, but it's the only one of the three books published by a mainstream house. 8 years after Avon published it, Manuscript Press published the 1st part, Archipelago. 21 years later, the third was published in 3 fairly expensive HC chapbooks by United Mythologies Press. Its name as a complete novel is More Than Melchisedech, but UMP named the 3 parts Tales of Chicago, Tales of Midnight and Argo. The religious allegorical nature of the story only really becomes clear in Melchisedech. BTW, I'm enjoying reading other posts on your blog. Sorry, I meant that I've read most of his published work. Obviously, I read all of Past Master - several times.